Although not as popular as they once were Cybex ellipticals are still some of the best cardio machines on the market today. Sure, they're expensive, but you get what you pay for. These are high end trainers built to the highest standards that put you in the most ideal position to get the maximum results from your workouts. Cybex is one of the originators of commercial great exercise equipment, currently holding over 90 patents. They are a mainstay in high-end gyms across the world, and make over 150 different machines, from strength equipment to group training to of course their popular cardio equipment line. When you buy Cybex, you're buying quality. You can rest assured that the treadmill, bike, Arc Trainer or elliptical that you buy will give you years of use, with little to no maintenance required. You have a number of options when it comes to Cybex ellipticals. There is one traditional model, called the V Series; there are the popular Arc Trainers; and there is the SPARC machine. This is Cybex's version of the traditional cross trainer, pictured above. Although it looks like your average elliptical, it's much more club quality than you find elsewhere. The V Series is compact and sleek, with an 18" stride, moving and stationary handles, two console options (LCD and TV), a 350 lb. max user weight and adjustable incline. These are the most popular cardio machines that Cybex offers, giving you more freedom of movement and essentially three workouts in one. 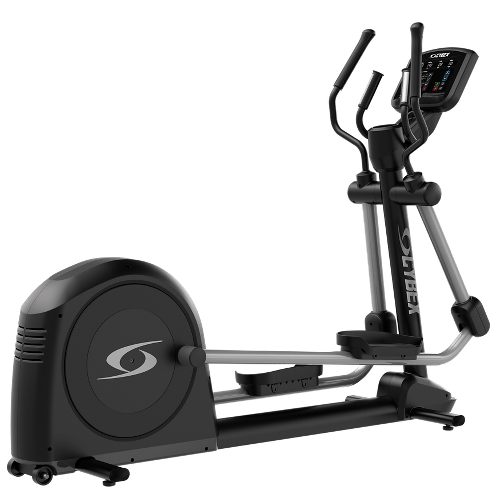 The series consists of the 525T and the R Series ellipticals. You can learn more about the Cybex Arc Trainers here. This is like an Arc Trainer on crack, a HIIT training machine for building muscle, burning fat and gaining strength. SPARC stands for Strength Power Accelerated Resistance Cardio, and it's easy to use and very low impact on the joints. As we mentioned, the Cybex ellipticals are definitely not cheap. They start at around $5000 and work their way up from there. You can buy them used however and save a few thousand. That's why you find them mostly in commercial gyms. They need to have high quality equipment that can take a beating because so many people are using them all day, every day. For the home, you don't necessarily need something this high end, but if your budget is open and you want the best of the best, Cybex is a very solid option for you. So take a look through the lineup to see which Cybex elliptical appeals to you. Which Cybex Elliptical Should You Choose? Picking a Cybex elliptical comes down to two things: your budget and your intended use. If you are looking for a traditional elliptical workout, then your decision is easy. Go with the V Series. You can decide if you want the console that it comes with or upgrade to the TV. If you want something a little different with more freedom of movement, then look at the Arc Trainers. Again, these are the most popular machines in the Cybex lineup, and there's a reason for it. They tend to be a little pricier than other Cybex ellipticals, but they are unique and special, and worth considering. If you are more of a HIIT, or high intensity trainer, then take a look at the SPARC machine. This is ideal for those who are into circuit training, and like to mix in workouts on and off the machine. There are all sorts of options on the SPARC, and it minimizes impact on your joints so you can really go all out without paying for it afterwards. So try to figure out how much you have to spend and how you intend to use the machine, then take it from there. Besides the high price which may be out of reach for many people, there are some other things to think about when it comes to Cybex ellipticals. For starters, they don't have all of the bells and whistles that some of the more residential brands have. There aren't a ton of built in workouts...there aren't any interactive programs with workout tracking and sharing. Some models have touch screens but that's an upgrade not standard. So what you're getting is very high commercial quality...that's what you are paying for. As long as you know that going in you'll be OK. If you're more into the bells and whistles, look at a residential brand like NordicTrack and Sole. Also, you can't buy Cybex ellipticals direct...you'll have to go to a dealer to make your purchase. You can't go wrong with a Cybex elliptical. They are top of the line and built strong to handle whatever you have to throw at them. They're certainly not cheap, so make sure you have the budget for it and will commit to working out regularly so you don't end up with a $5,000 coat hanger. If you're hesitant, consider one of the more reasonable high end brands like Life Fitness and Matrix. They both make great elliptical trainers and you can save yourself a few thousand dollars.